I know this has been on the internet for a while now but I really think this clip needs to be on my blog. When she says "U.S. Americans." When she says "The Iraq." When she says "everywhere like such as." When near the end she seems to gain some confidence and starts talking with more emphasis, but is still just as far away from actually answering the question. Apparently last night I struck again (although I have no memory of any of this). 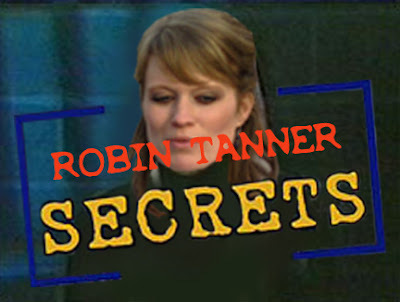 Robin informed me this morning that last night at 3 a.m. I crawled over her to get out of bed (very carefully she says) and left the room, I did "something" somewhere in the house, and came back a few minutes later, carefully crawling back over her again to get into the bed. How curious. This is very unlike my normal sleepwalking activities. Why would I crawl over her to get out of bed? I could get up on my own side of the bed, walk to the door, sleepwalk and do whatever I do while I sleepwalk, and get back into the bed on my side like I normally do. Something strange is going on here. 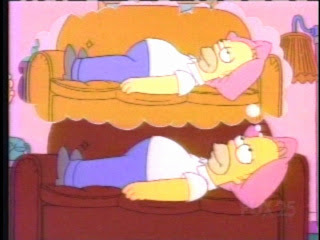 Then again, if I were thinking logically during my sleepwalk escapades, I probably wouldn't sleepwalk in the first place. Also, I would like to know what I was doing while I was sleepwalking because this morning I was exhausted, even after 9 hours of "sleep." I asked Robin but for some reason she didn't get up to follow me. (Wasn't she curious?) My guess is I used Robin's pilates exercise ball, played Wii tennis for a while, or cleaned the bathroom, but I don't think we'll ever really know for sure. 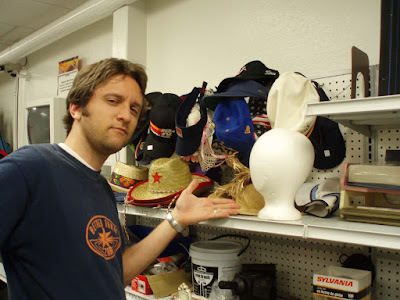 Looking for wigs and dance tapes at the DI. 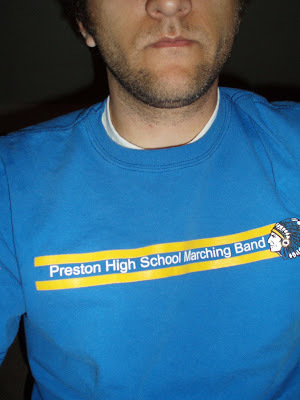 No wigs or dance tapes, but I did buy this amazing $3 shirt which I am wearing as I write this post. Just longboarding in front of Pedro's house. "Hey Robin, if you come to the dance with me this weekend I'll build you a cake or something." As you can see, I'm basically a Preston expert. So, if you ever need a tour guide and want to take a drive to Idaho, just let me know. Robin always seems to roll her eyes when I watch sports (although somehow shows like Big Brother, October Road, and Gilmore Girls are cool). But now I have proof that she secretly likes one of my favorite sports shows, Pardon the Interruption (weekdays on ESPN at 5:30pm ET)!!! 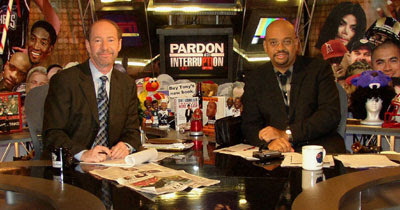 The loveable Tony Kornheiser and Mike Wilbon. 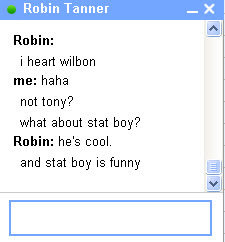 Here's the proof, taken directly from my Gmail chat history!!! Now, if only I can get her on board the Wii train! Ben, can I come play at your house? A lot of you probably know that I sleepwalk and sleeptalk. Here are my top ten stories. Vote on the poll for your favorite story. Mission #1—In my first city I was in an apartment with three other Elders. They didn’t always go to bed on time. One night they were up late in the other bedroom when I “woke up,” came in, and asked, “Do you need to wash your hands?” They started laughing at me and I got offended so I stormed out and said, “If you’re going to laugh at me, I’m going back to bed!” On my way back to bed I stopped for a drink in the bathroom but they heard the water and thought I was washing my hands so they laughed even harder. Mission #2—One night my companion and I were taking the overnight ferry boat from Rome to the island of Sardegna. We had a little cabin with two bunk beds and a sink. It was comfortable enough and we had made this trip back and forth pretty often but one night I think I felt claustrophobic because I woke up and started yelling over and over, “Let me out, let me out!” as I banged on the cabin wall. My companion woke up and yelled, “Elder, shut up! You’re sleep talking!” I woke up and realized how foolish I must have looked so I just went back to bed without saying anything. BYU #2—Once I went to bed while my roommate Jake still had the light on. Like any sensible person I had the covers over my face to block out the light. Suddenly I started thrashing around and yelled, “Get these freaking black things off of me!! !” In my “dream” I thought some spiders were hanging from the ceiling and attacking me and reacted like any sensible person would have in that situation. BYU #3—Once I woke up in our apartment at The Colony in Provo, went downstairs, opened front door, and looked outside for a while. Then I went back to bed. Also around this time I once took a shower in my sleep and went back to bed. The reason I know this happened is because when I really woke up in the morning to get ready, my towel was all wet and the memory came back to me. BYU #4—Another time in The Colony I went downstairs in the middle of the night and sat on the sofa while my roommate Ben talked to his old mission buddy. He asked me if I was sleepwalking and I said no (I will always tell you I’m awake if you ask me, even though I’m probably not). I sat there for a while, didn’t say anything, and then went back to bed. BYU #5—Also in The Colony apartment, my roommate Josh woke up in the morning with a magic marker mustache and suspiciously there were magic marker markings (the same color) on my hands that same morning. We still don’t know to this day what happened there. 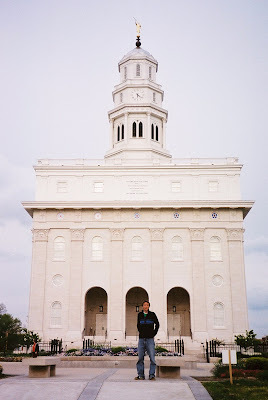 BYU #6—My friend Luke and I backpacked around Italy for a month after I graduated from BYU. We usually stayed in crappy, crowded hostel rooms to save money. This one place in Rome had 4 bunk beds in the same room. 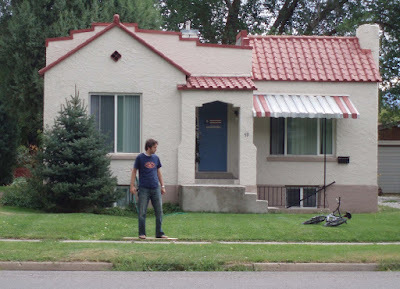 This 25-year-old Australian guy kind of ran the place in exchange for free rent. Apparently he slept in whichever bed was free each night. In the morning he said to me, “Mate, you scared the %$#@ out of me last night! You were crazy!” Apparently he came into our room late that night to sleep and I jumped out of bed with a crazed look on my face, yelled at him, and scared him off. I’m not sure where he ended up sleeping that night. Seattle #1—Robin woke me up in the middle of the night to tell me to turn off the reading lamp on my side of the bed. “Why is it on?” I demanded, annoyed that she woke me up. For some reason, I wasn’t the only annoyed person that night. Seattle #2—One morning a few weeks after we were married, Robin woke up and found all her purses lined up nicely over her feet at the end of the bed. These purses usually live on the wall across the bedroom. When I woke up I asked her, “How did they get there?” For some reason she blamed me. Here are the results of the poll. Looks like a tie. Summer 2007: My last summer vacation and it wasn't even a real one. First, I finished my last law school finals in May. Then graduation on May 12. Then studying for the bar full-time June to July. Then the bar July 24-26. Now the job search. Here's a retrospective look at my "summer." Safeco Field, home of the Seattle Mariners! Let me tell you, it's an amazing feeling when a whole stadium of people cheers wildly for you. And doesn't throw oversized syringes when you walk on the field (Barry, you know what I'm talking about). Also, you can play Where's Waldo with this picture. See if you can find my lovely wife and mother. 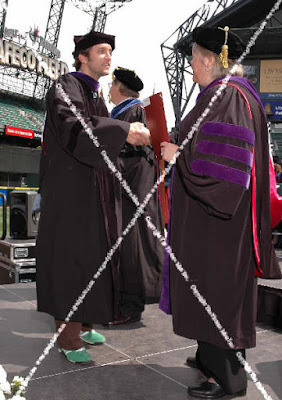 The big moment where they give you the fake diploma. For some reason my camera has been acting up and adds big white X's to my photos. Who knows why. You'll give me biscuits if I stand up in the middle of the ceremony?!?! It's a deal! Here was the scene at the bar. Unfortunately for those rows crossed out, statistically they won't pass (Washington has an 80% passage rate). Lucky for me I was sitting where the red arrow is pointing so it looks like I should be okay. This is how I prepared between sessions. I think we all have heard of Smelly Cat thanks to Phoebe on Friends. (P.S. What a lame show that was). But have you heard of Scuba Cat? I now bring you Hawkeye. After watching the Discovery Channel's Shark Week this week, there's no way I'm ever going scuba diving (I saw a guy's calf get bitten off). But thanks to Hawkeye, the world's first scuba-diving cat, I don't have to. Hawkeye, this one's for you, my four-legged friend. Last year my ward had a big kickball game for an FHE activity. East Side v. West Side. Of course there was trash talking for weeks up to the big game. And there were “training sessions” where we were supposed to practice our kickball skills and make our team t-shirts. So, a week before the game my team was tired of all the trash talking and decided to stage a little attack on the other team while they were making their t-shirts. Above is a video of the attack and here's the scripture summary I wrote and emailed to the other team afterwards. The plan went perfectly and guaranteed a moral victory for us, even if we had lost the actual game (which we didn’t). 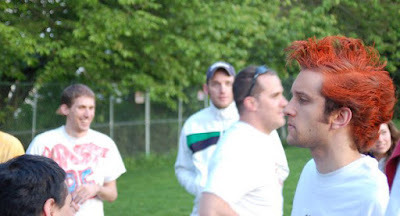 The orange mohawk intimidated the other team during the game. Our team name was The Fetchers United (loosely based on the successful English football team Manchester United). Wow, what a beautiful uniform. About to kick an RBI double. We won 10-5 or something like that. 1. And it came to pass that I, Christian, being born of goodly FHE parents, therefore I make a record of my proceedings in my days. 2. And there was peace in the land for many weeks. 3. But behold, it came to pass that the Lamanites of the East began to stir up unto anger my brethren, the Nephites of the West. 4. For they would speak trash unto us as we worked in our fields, our offices, and our classrooms, and as we checked our email. Yea, one even spoke trash unto us as he made announcements during Elders Quorum. For this, the Nephites were not appreciative. 5. And it came to pass that the Lamanites of the East and the Nephites of the West were for the space of four weeks gathering together the people, that they might get all who were upon the face of the land, and that they might receive all the strength which it was possible that they could receive. 6. For behold, the people knew that the final kickball battle would soon commence among them. 7. Therefore, I, Christian, knowing my people of the West to be a righteous and fair and delightsome people, therefore I did gather them together and did arm them with all manner of weapons of war. 8. And it came to pass that while the Lamanites of the East had thus been obtaining power by fraud and deceit, I, Christian had been preparing the minds of the people to be faithful unto the Lord their God. 9. Yea, and we did arm ourselves, yea, with balls of curious workmanship. And behold, they were red and filled with water. For behold, the Lamanites of the East did wear only t-shirts which they had made of skins of wild beasts. These t-shirts did bear their team name: the Cheats of the East. And we knew that the Lamanites of the East would not be protected from our balls of curious workmanship. 10. Therefore, a house on 35th Avenue had fallen into the hands of the Lamanites of the East and we desired to lure them from their stronghold. 11. And it came to pass that I, Christian, did cause a search should be made among my men, that perhaps we might find a descendant of the Lamanites of the East among them. And behold, two brave souls, even Matt and Becky, did volunteer to enter the house on 35th Avenue. Yea, they entered the house and were unsuspected by the Lamanites of the East. For behold, the Lamanites of the East, being drunken by day, did believe Matt and Becky to be on their kickball team. 12. And now, as Matt and Becky had created a diversion, I, Christian, stole away privily into the house on 35th Avenue. For behold, having no hopes of meeting them upon fair grounds, therefore I resolved a plan that I might decoy the Lamanites out of their stronghold. For behold, the Lamanites of the West were exceedingly many. Yea, there was Johnny, and Sam, and Megan, and Cassie, and Beren, and Gretchen, and Paul, and Jenny, and Chris, and Josh. 13. Behold, they were great in number but small in stature. 14. Therefore, I entered the stronghold, and behold, to my astonishment, I found that the Lamanites had built a remeumptom, that they might pray to their vain idols of worship. And behold, they did stand upon this rameumptom and talk trash, that they might build themselves up upon their vain ambitions and pride. 15. For behold, they wore chains and bracelets and rings and nose jewels and crisping pins and changeable suits of apparel and headbands and ear-rings. And behold, I, Christian, being very astonished at their vanity and pride, knew that great would be the fall of it. 16. And it came to pass that the Lamanites of the East began to make themselves merry, insomuch that they began to dance, and to sing, and to speak with much rudeness unto me, yea, saying, "Thou art of the Nephites of the West and thou art a spy, and thou shalt leave our presence immediately." 17. I spoke out to the Lamanites of the East, and bade them follow me but they would not. 18. Therefore, I took some of their kickball t-shirts of skins and ran for my life out of the stronghold. 19. For behold, I had placed men all about the entrance to the stronghold such that they were not found by the Lamanites of the East. And it came to pass that the Lamanites of the East followed me, yea, even out of their stronghold. And Matt and Becky were left behind that they might take prisoner the remaining guards and secure the stronghold from the inside. 20. Yea, the inward vessel shall be cleansed first, and then shall the outer vessel be cleansed also. 21. And it came to pass that when the Lamanites of the East had followed me outside, I did yell to my men that they might attack. For behold, I yelled "Stingray!!" for this was our code word that meant attack. 22. And it came to pass that my men did fall upon the Lamanites of the East, yea, insomuch that we began to destroy them. And they did fall before us. For behold, they were covered only in their kickball t-shirts of skins such that they were exposed to the blows of our balls of curious workmanship. 23. Yea, and it came to pass that Emily, and Tom, and Elisha, and even Martin did fall upon them, with their ten thousand, yea and Ciara, and David, and Bob, and Sam, did fall upon them with their ten thousand, yea, and Andrew, and Clay, and Ariel, and Von, with their ten thousand did fall upon them. And the battle was exceedingly fierce. 24. For behold, my men were inspired by a better cause, for they were not fighting for monarchy nor power but they were fighting for their homes and their liberties, their wives and their children, and their all, yea, for their cities of worship and their church. 25. And I did see that the Lamanites of the East did fall before us unto their destruction. And behold, I, Christian, being a man who did not delight in bloodshed, therefore I did call unto my men to cease the destruction upon the Lamanites of the East. 26. And it came to pass that we did fall back, yea, even that we did take the stronghold without the loss of one life while our brethren the Lamanites of the East did suffer many casualties, yea, even so many that they stood no chance in the final kickball battle for which the people had been gathering for four weeks. 27. And it came to pass that we returned unto our lands, and our fields, and our hot wives, and our children, such that we did have peace again in the land. For behold, we knew that no matter what the Lamanites of the East could do to come upon us, we had already won the critical battle--for behold, they had lost face as we had stuck it to them and defeated them in the battle of the trash talking, even without the podium of the Elders Quorum President as he made his announcements against us each Sunday. 28. And it came to pass that I, Christian, seeing that I began to be old, therefore I did take unto me a handmaiden, yea, an exceedingly beautiful maiden, and we did depart out of the land, and I did pass the records unto my loyal Lieutenant, Brother Tom. And now I end my writing. 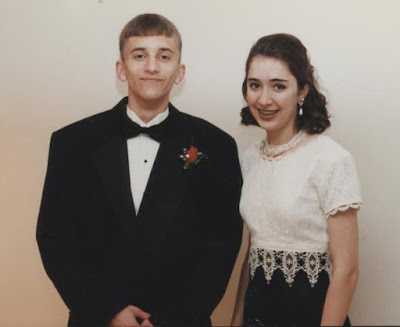 I went to my Herndon High School senior prom back in 1996 and no offense, Camie Poulton, but that wasn’t my most memorable prom experience. (Some might say my hair looks really goofy in this picture but if it was good enough for George Clooney back in the mid-'90's it was good enough for me). The April before law school started, my friend Ben and I were driving home from his last semester at BYU. 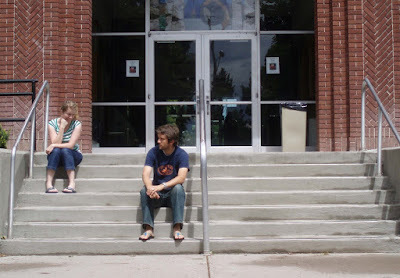 (That was also the semester where I was a ski bum at the Sundance Graduate School of Winter Sports). We got our pizzas and were enjoying ourselves but we were confused when we kept seeing teenagers dressed in fancy dresses and tuxedos walking by. We asked our waitress what was going on and she said there was a prom downstairs in the ballroom. The Mt. 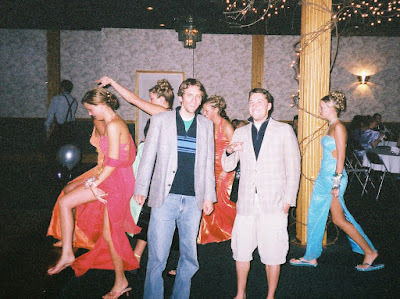 Sterling High School prom, to be exact. We joked about going down to check it out but we decided not to, not because we didn’t have dates and were 25 years old but because we didn’t have anything to wear. Keep in mind I was wearing jeans and a zip-up sweater and Ben had on cargo shorts and flip flips. Ben got up to answer his phone and came back to inform me that he found some tweed jackets in the Lost and Found closet. Obviously we had to attend the prom now. 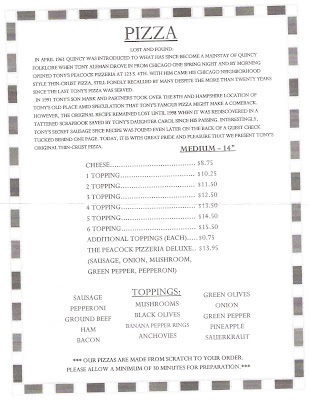 So we asked our waitress permission to go to the prom. She said it would be okay and even said she’d take our picture down there. So we went downstairs to the ballroom and beheld a marvelous sight: A dance floor, a punch bowl, disco lights, and a lot of girls in dresses. Ben bolted straight for the dance floor and started busting a move in the middle of a circle of 8 girls. I couldn’t stop laughing. So we danced and worked it. The girls loved us. Then their dates, who were at the punch bowl instead of dancing, saw us with their ladies and came over. 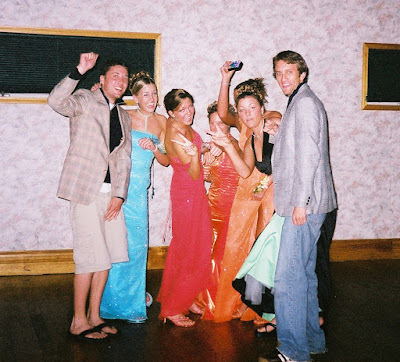 They wanted to know who we were, how we found their prom, and where we got the jackets. All valid questions, I guess. We told them we were on business from Virginia. They seemed to think it was pretty cool we were there but everyone had a funny look on their face and didn’t believe us. Then we figured out that there is a Virginia, Illinois not too far from Mt. Sterling. Who knew? Apparently the kids liked us because they kept dancing with us. And the prom wasn’t all that different from a stake dance because every 4th song was a slow song. I don’t remember which song they played but I do remember Ben saying really loudly to me so the nearby group of girls could hear that he wished we had someone to dance with. Immediately two girls came over and asked us to dance with them during the slow song. We danced the night away but the song and fun ended when we saw an older man in a suit start walking towards the dance floor. The Principal! Ben booked it upstairs, I said bye to the girls and followed, we put the jackets back in the closet, and got out of there. So, that was my second prom. If you ever have a chance to attend a prom in the basement ballroom of the pizza restaurant where you are eating during your cross-country trip, I recommend that you stop by and hit the dance floor.